Most builders fill their model homes with upgraded features so its important to find out which features are standard. Be sure to ask how much the upgrades cost. Unlike existing homes, you may not have much negotiating leverage when working with a builder. However, many builders offer special incentives if you use their preferred lenders and title companies. It’s common for builders to provide a one-year warranty on workmanship and a 10-year structural warranty. Be sure to ask your builder what their warranty covers and note any limitations. You should also receive separate manufacturers warranties on the appliances (i.e. air conditioner, water heater, stove/oven, etc.). Depending on the size of the land, most builders build out a community in sections; so depending on when you purchase, you could be in for several months of on-going construction. Check to see if the builder has similar communities nearby. This may give you additional options in floorplans, features, pricing, and/or lot location that may not be available at the community you’re visiting. 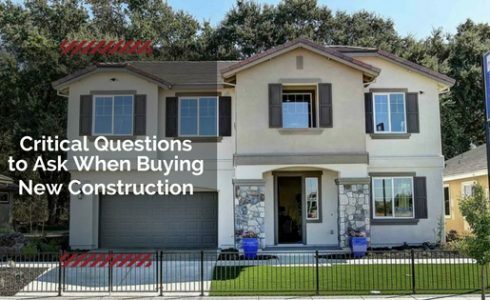 These questions will help you decide if a new construction home is right for you. When you’re ready to make the leap to homeownership, visit DiscoveryHomes.com to learn more about our communities throughout Northern California and Nevada.